In the opening scene of The Lego Batman Movie, Joker (Zach Galifianakis) hijacks an airplane from MacGuffin Airlines. When he explains his dastardly plan to the airline pilot, listing all the Gotham supervillains he’s recruited to his team, the pilot asks, “Did you make some of those up?” Nope, they’re all real, and as the Joker says, “probably worth a Google.” The two strangest villains on Joker’s lineup are undoubtedly Egghead and Condiment King, and though these two don’t have comics origins, their canon stories began somewhere even stranger. Egghead is a zany supervillain created for the 1960s Batman TV series starring Adam West. Lego Batman takes more from this cultural phenomenon than most recent comics adaptations, because its comedic tone allows it to explore the silliest of Batman’s canon. 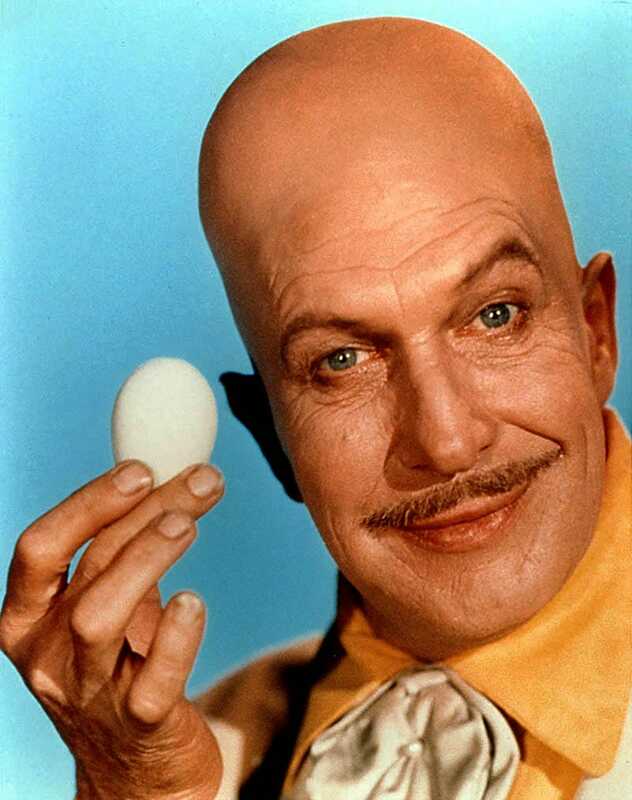 After appearing in a 1966 episode of Batman entitled “An Egg Grows in Brooklyn,” Vincent Price’s Eggman went on to appear in six more episodes. In 1989, a DC comic called Secret Origins Special #1 named him as a has-been villain who had once worked with the Riddler before being thrown in prison. Throughout Batman canon, Egghead has used quite a few egg-themed weapons, but he literally just throws large eggs at people in Lego Batman. The other strange villain on Lego Joker’s lineup is Condiment King, whose powers in Lego Batman amount to simply owning two guns, one which squirts ketchup and the other mustard. His guns seem to misfire a lot, and the mistake is accompanied with a loud fart noise. Condiment King was created by Bruce Timm and Paul Dini for Batman: The Animated Series as a callback to the ‘60s TV series. Batman: The Animated Series was a dark return to a familiar brand, but its production team had a masterful eye for incorporating Batman’s long canon storylines, so Condiment King felt organic. In the episode “Make ‘Em Laugh,” Condiment King chased Batman with his ketchup and mustard guns, almost killing himself when he slipped on some ketchup and nearly fell off a roof. The end of the episode reveals that Condiment King was simply a Gotham stand-up comedian brainwashed into a lackey by the Joker. Egghead and Condiment King appearing in The Lego Batman Movie is just more evidence of director Chris McKay’s playful respect for DC canon, across comics, animation, and live TV. The Lego Batman Movie is currently in theaters.